Wild Elephants and Tigers, Oh My! In mid-April, our group decided to take a trip to Corbett National Park, which is a large and famous tiger reserve in southern Uttarakhand. Our visit was an incredible learning experience, as it not only provided an opportunity to view rare wildlife but also to consider some important issues regarding park management and ecotourism. While in the park, I noticed many tenuous issues, especially with regards to the park’s heavy regulation of tourist activity and its relationship with the surrounding community. As we first drove into the park, I was immediately drawn to notice the contrast in access models between American national parks against Corbett’s strict limitations on vehicles and pedestrians within the park. I am accustomed to parks in the US with universal access provided by way of well-paved roads, large visitor centers, and recreational facilities including campgrounds and miles of hiking trails. The threat to visitors’ lives exists in both cases – put simply, here, it’s due to tigers and leopards, and there, bears and wolves. In cases where strict rules are absolutely necessary in the US, such as in extremely fragile alpine climates, regulation exists in the form of required permits and limited trails. Thus, I wonder how differences in access policy affect conservation efforts in parks, as I believe most human impact in these environments is caused by tourist activity. My second thought was about the park’s history. 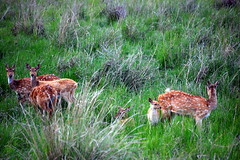 Given India’s high population density, it was hard to imagine that the area within the park’s boundaries was previously uninhabited. I have since learned that upon the park’s creation, people were forced to move outside of its borders in order to provide a sanctuary for tigers and other wildlife. While this effort has resulted in measurable success to conserve India’s tiger population over the last few decades, it has undoubtedly had an impact upon the surrounding community. We stayed at a dormitory residence in Dhikala, a small settlement in the center of the park, which is surrounded by a formidable electric fence. 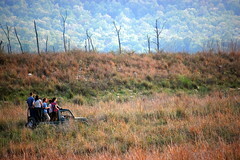 From there, we were able to explore the park via jeep and elephant safari every morning and afternoon. Since we stayed there for two nights, we had the opportunity to go out four times, and every trip resulted in sightings of elephants, deer, birds, and other wildlife. On top of all of that, we were able to get a glimpse of a tiger in the wild! As we left the park, we had an opportunity to sit in on an seminar hosted by the International Ecotourism Society. Because the park attracts a significant number of visitors every year, tourism has become an important part of the economy in the surrounding areas, including the nearby towns of Ramnagar and Chhoti Haldwani. While we were there, Carolyn Wild, an ecotourism consultant from Canada, gave a well-attended talk on using indicators to assist in sustainable tourism development. While giving the presentation, she focused on leveraging tourism to provide benefits for the local community, while promoting sustainable development to attract more tourists in the future. Along these lines, while she expressed the importance of sustainable tourism development, Wild did little to explain what measures could be taken to attain sustainability. Had she done so, the audience would have been better equipped to make tangible changes in their businesses and lifestyles to practice sustainable tourism development in the Corbett region. In addition, Wild did not discuss the education of tourists as a means for protection of the surrounding environment instead choosing to focus on the economic wealth brought to a region by tourists. Judging by the audience present at the seminar, the impact of tourism has likely been largely positive due to increased tourism in the region. I am curious to know how the park’s creation has affected people who are not directly involved with tourism, as well as in other regions where park creation is similarly taking place today. 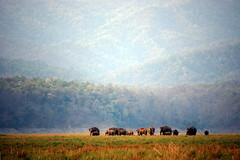 All in all, I was completely awed by the experience of staying in and exploring this vast wildlife reserve. Hopefully it will remain a successful endeavor to conserve nature and biodiversity for future generations.